SEATTLE'S JASON LOLLAR not only builds fine pickups, he also builds archtop, solidbody, and lap steel guitars (his list of clients includes National, DeTemple, Harmos, and Zero Guitars). And he authored a book with the self-explanatory title Basic Pickup Winding and Complete Guide to Making Your Own Pickup Winder. All of Lollar's pickups are wax-potted (to eliminate squeal) and ship in a plastic box with full wiring instructions and mounting hardware. The bridge pickup of the Vintage Telecaster set sports slightly smaller, flat polepieces with tape surrounding the coils (instead of string). The neck pickup is hand-wound to '50s specs using Alnico V magnets. It includes a chrome cover. The bridge pickup is reverse-wound with reverse polarity, so when both pickups are on, they are humbucking. And both use cloth-covered wires. The P-90 Soap Bar Style pickups use Alnico V pickups and are scatter-wound, Lollar says, for extended frequency response. Black or cream covers are included. Pickup leads have standard vintage braided shielding over a single lead wire. The P-90 Soap Bar Style set is also wound to be humbucking in dual-pickup mode. The Imperial PAF humbucker set uses braided shield wire. This set ships with nickel covers; gold is an option. 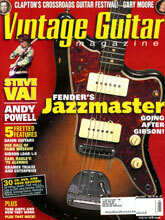 We installed the Vintage Telecaster Style set in an early-'80s Strings and Things Bluesmaster II. The P-90 set was installed in a late-'80s Hamer Special. The humbucking set was installed into a new Washburn X Series solidbody. Our test amp was a Peavey Delta Blues all-tube combo with two 10" speakers. Feeling a twitch for twang, we started with the Vintage Telecaster-loaded Bluesmaster with the pickup selector switch to the bridge, and set the Peavey to clean. Stand by, Tele lovers! This is one of the best pickups we've ever heard, including true vintage; bass that was pronounced and punchy, high-end that was pleasant and clear, without the tear-your-head-off upper register. Overall tone is extremely well-balanced; this is a very musical pickup that'll satisfy any Tele connoisseur. Switching to the neck unit, we experienced a slight volume drop (nature of the beast), but again, there was fantastic musicality, with much more character, tone, and personality than your standard Tele neck pickup. It's a great companion for the bridge unit. Using the pickups simultaneously, we got the humbucking mode with an exceptional Tele dual-pickup tone. We also switched the Delta Blues to overdrive and got a very solid, nasty rock tone from the bridge pickup, without substantial squeal. Age will only make this set better and possibly surpass any Tele set ever made. This is a great pickup set. Next, we plugged the P-90 Soap Bar Style-loaded Hamer Special into the Delta Blues, still on overdrive. We also adjusted the polepieces to compensate for the fingerboard radius. And sure enough, the bridge pickup delivered all the punchy, growly, spit-in your-face tone you love in a P-90! Switching to the neck pickup, we were greeted with an fat, fat tone with sweet, sparkely highs. Very bluesy. In the middle position, we got a great humbucking bluesy single-coil tone to die for. This set sounds identical to a set of good vintage P-90s. In the clean mode, we got a fat single-coil tone in the bridge position and a pure, full tone in the neck position. This could be the set of replacement P-90s. Next, we grabbed our Imperial PAF-loaded Washburn, and again, left the Delta Blues on OD. Straight away, we were hit by a fat, full PAF tone in the bridge position, but with slightly mellower highs. The mid-range jumped, with complete meatiness. In the neck position the units delivered nice PAF tone with mellower highs and punchy raids, allowing us to play those blues passages without tearing off heads. Lollar calls it "airy brightness." So yeah, we like these. When it comes time to spice up your tone, Lollar is an excellent option.